I have a new card for you - yay! 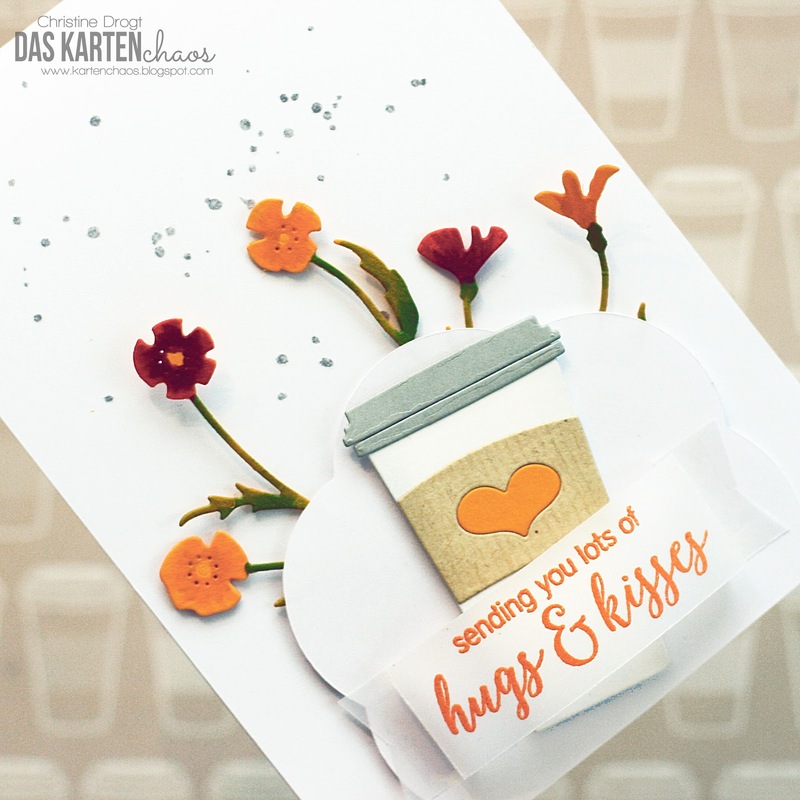 I guess you all know about the Coffee Lovers Blog Hop (by the way - Create A Smile is sponsoring a 20€ gift card.... ;) ) - wehre it's all about coffee AND about spring! Cut a Clouds panel, adhere you flowers to the back of it and use dimensional adhesive to add your floery panel to your white cardbase. Use dimensionals to also adhere your mug to that panel. yellow/orange emboss your sentiment onto some vellum, fold a baner shape and adhere it over your mug. To finish off the card add some grey sprinkles to the background, repeating the color of the mug's cap. Sometimes a card just won't look finished. Some ink sprinkles can make a HUGE difference! Oh how I adore this, my favorite card I've seen hopping today! So gorgeous! I love everything about it. The colors, the vellum, the diecuts, the splatter...Perfection! Really perfect for blog hop..
Those flowers are just too cute! Sweet card, with lovely little touches. Oh...this makes me eyes very happy! Just beautiful! This is as sweet as can be. After one smitten glance at this awesomeness, I ordered the Penny Black cup and sentiment...YOU Rocked it! What a fun card, Christine, love those flowers! Happy Sunday and Happy Hopping! Christine, this is BEAUTIFUL...I love your choice of colors! Such a beautiful card! Love all of the great dimension and detail you've added! Beautiful flowers. Love the dies and the color orange is pretty. Hello Christine,that sure is such a pretty card. Love the splatter in the background. Oh Christine, this is so pretty! Love your choice of colors. Love the arrangement of flowers with the coffee cup. So pretty. Simply adore the dainty flowers! LOVE your SWEET sentiment, PRETTY flowers and DELIGHTFUL design!!! I super love this card, Christine!! Don't know how I missed this during the blog hop, but so glad to see it now! Love your card and simple design.